HERNDON, VA — April 16, 2019 – Peraton was awarded the Unmanned Maritime Systems Support (UMSS) Marine Mammal Systems Engineering Services contract with the U.S. Navy’s Space and Naval Warfare Systems Command (SPAWAR) Systems Center (SSC) Pacific. The 30-month indefinite delivery/indefinite quantity task order is valued at $12M. This is one of seven task orders the company has under UMSS for technical and operational support to SSC Pacific Maritime Systems Division for its expertise in unmanned maritime systems engaged in mine counter-measures. 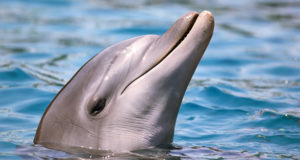 Under this task order, Peraton performs logistics planning and analysis for marine mammal systems and ensures the systems’ certifications; provides design engineering and fabrication for marine mammal specialty and ancillary equipment; and supports the maintenance support for all deployable equipment. The Marine Mammal Systems Engineering Services task order specifically supports the SSC Pacific Reconnaissance and Interdiction Division from three primary locations: Naval Base Point Loma, San Diego, California; Naval Submarine Base Kings Bay, Georgia; and Naval Base Kitsap, Bangor, Washington.